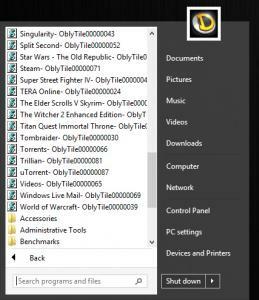 SiB is working great, thanks, bought two licenses, but only have one small issue so far, tiles created using OblyTile appear in the top of the start menu and there is no option in SiB to hide modern tiles, if I switch to Start8 I don't see the tile shortcuts. Is this feature going to be enabled in the future or at least there is a secret way to hide the custom tile shortcuts in SiB? OblyTile since 0.8.8 does not create shortcuts in All Programs, so you should use newer version. You can move those shortcuts to %localappdata%\Microsoft\Windows\Application Shortcuts\OblyTile folder yourself. Weird, I'm using version 0.9.7 and keeps creating them on All Programs, actually never used OblyTile until this week so never had old versions. 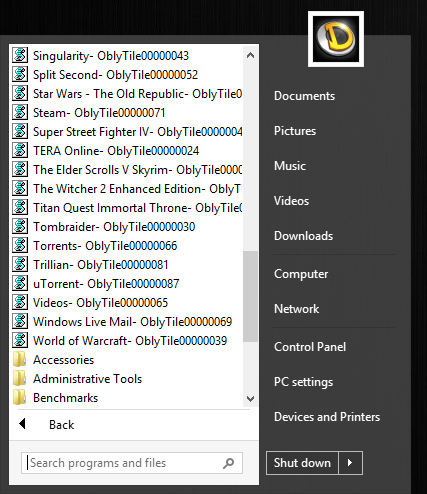 I moved the shortcuts to that folder and now none of the OblyTile tiles on start screen work, thanks for the info, I'll contact the OblyTile developer and see if it is a bug. I really liked the look of the default start button in 8.1 before installing SIB+. It's a little more complicated than other start orbs, so it can't be fully represented by the png files that are typically used. Would you consider adding a feature to SIB that restores or mimics the default 8.1 start button? 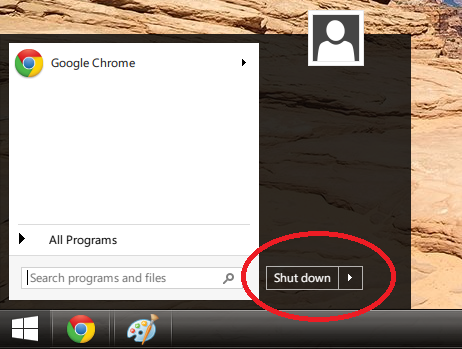 Is there any way to fully hide the Shut Down button? I know that I can change it to Lock or Log Out, but that doesn't solve my problem. Problem, or preference? What "problem" does having the Shut Down button visible create? Maybe he wants a Kiosk mode and prevent shutdown? I thought of that possibility, but then he'd also need to block the use of CTL-ALT-DEL, block the use of the various corners on the touch screen, etc. Also, how does he intend to restart or shut down when necessary, use the power button? Unplug the machine? In any case, knowing his reason for asking will hopefully shed some light on the issue so we can advise him better. Heh, I had a feeling people would take it the wrong way (I rewrote my post like three times ). It's not really a 'problem', just something that 'irks' me. Thing is that I've pressed the button multiple times by mistake, either when using the computer from far away (with MouseWithoutBorders) or just when being in a hurry/sleepy. But I'm sure people would like it for other, more 'proper' reasons too. I mostly shut down the computer manually by pressing the physical power button on the computer, but also sometimes via CTRL+ALT+DEL. 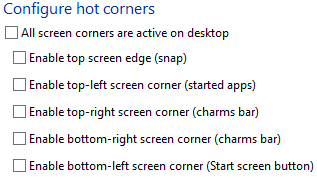 I'm also a huge desktop customizer/tweaker so a GUI-button I don't use I'd rather not have there. If it's hard to implement or otherwise low priority I understand. 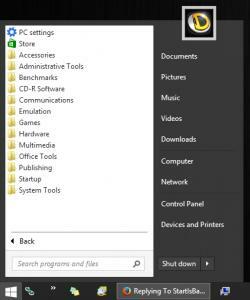 I love the program and wouldn't be using W8 without it! flyout (guess this how it should be looked). Download the 1.5.2 setup ad install it. I have a problem on a fresh Windows 8.1 upgrade - Help and support and Run are not localized. Everything else is... I see that it should be fixed with beta2, but it is not. I should probably mention that SIB was installed before changing LIP.